I won Andrea's Blog Candy on the Operation Write Home Veteran's Day Bloghop. Today, I received a box full of Embossing Powders from Andrea. Wow~ that's so many! Thanks to Andrea and I will use them for making cards for heroes as per her wish. I made this Valentine's Day card with the image of Love Bird that Alison of Stretch N' Bubbles offered for free on the Operation Write Home Veteran's Day Bloghop Saturday, November 14. I was thinking about making birthday cards for Operation Write Home and then I came up with this card by using Unscripted Sketches #32. This is my first play with their sketch. I get inspired by their sketches although I haven't played until now. I got the digital stamp a while ago from the Sew Many Cards-Digital Stamps. I got this Blue Poinsettia image from Fred, She Said Designs a while ago when I had a Red Poinsettia. Personally I never seen this color of poinsettia before however, I wanted to use it. This morning, I came up with this design of card that is a very interesting combination I think. I hope Any Hero will like it. I made these LOVE cards for kids that Fabre of Operation Write Home requested yesterday. Operation Write Home: Shipper Fabre here - just got in a special request for a box with LOTS of love cards for kids, aged 1-7. Unit has a lot of small children, and they could really use them. Got time this weekend? If you could pop a few in the mail to me, that would be fabulous! I received this award from Ana. Thanks to Ana! grows deeper with each day. I made this card for tomorrow's Operation Write Home Veteran's Day Bloghop Saturday Nov.14. It's simple but it has lots of hearts in it even more than you can see. I hope you to join this event to show our support and thanks to our heroes. See you tomorrow. I like to share the story that Melanie posted on her blog. It is so true that we miss a lot of wonderful things to see and to be grateful for. 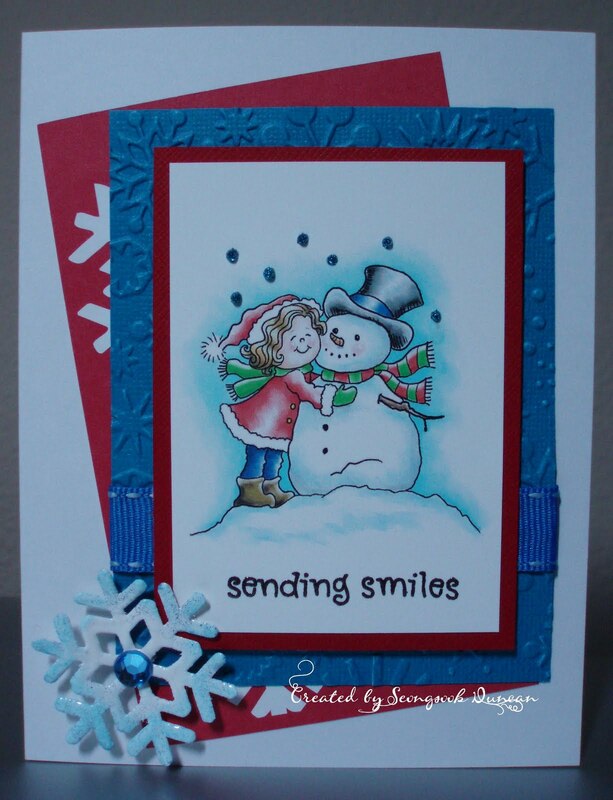 I made this card for November Card Exchange with Michelle at the Card Maker. For the card background, I used the Gridlines and the sketch that Nina Brackett used and I handstamped the leaf image in each square. In order to get this pdf file, visit Nina's blog. I made this card for Lori's Happy Birthday with the image that Alison sent me this morning. Lori is one of my friends at the Card Maker and she is the Digi Queen. I get inspired by her creation all the time. Happy Birthday, Lori! Hop on over to StretchNBubbles to see how to get it. Thank you, Alison! Thank You, David, my dear husband! I took these photos early this morning. Here I post them for many of those with my prayers. I made this cookie wrap to give my thanks to my team at work who gave me a birthday present. I stamped the borders on wrapping tissue and wrapped a cookie inside and closed it with a tag. I made this card for one of my Stamp TV friends.